Alan Lis helps fill in the gaps that we weren’t aware of, when posting the news that John Travis is the Technical Director behind the Epsilon Euskadi LMP1 coupe project, for Le Mans in 2007. 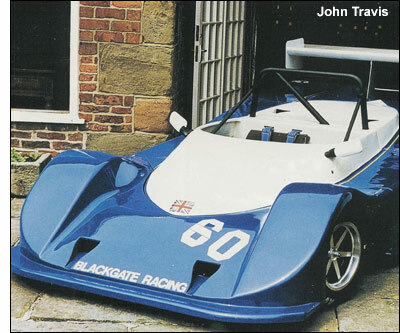 In fact it was Race Tech magazine editor Ian Bamsey who interviewed Travis in 2002, and from that item we discover that the man was a driver in the late ‘70s, initially in Formula Atlantic, then with an F2 March 792, entered by his own Blackgate Racing Developments. He naturally turned to developing the March – more downforce, and then his own tub when the downforce became too great for the original March one. He moved onwards and upwards with a RAM Cosworth F1 car, all the while working full-time as an engineer, initially in the motor industry, then in aerospace. By 1987 he’d done it – he produced his own race car, the one on the right: it was the BRD, with Hart power, which he raced in Thundersports in the UK. Lack of funds caused John Travis to turn to engineering the racing efforts of others, and he worked with none other than Roland Ratzenberger, as the Austrian moved up to F3, and then to F3000. Finances were tight, but the combined skills of driver and race engineer were sufficiently successful that Lola’s Mike Blanchet offered John Travis a role as Lola’s development engineer on the F3000 car. That evolved into a 1990 packed with F3000 and Nissan (built by Lola) Group C work, and thence to the Lola Buick Indy Car project. Travis became chief designer for the Lola Indy Car programme (1994, ’95 and ‘96), before a move to Penske (the PC27 and 28 were ‘his’ designs). And with this LMP1 coupe, John Travis has found one.